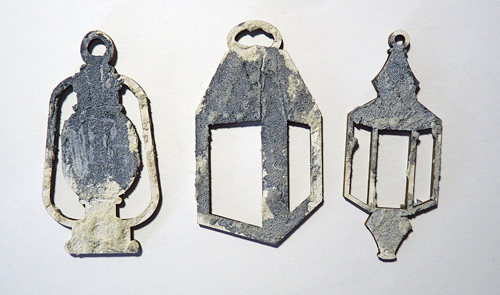 ........ and the Creative Guides who have already been travelling with these items and how they used them. First up was Nikki with her fabulous burlap panel. Next came Jennie with her pretty autumnal tag. and fourth was Jenny with her superb hessian covered canvas. So now it's up to me to finish this five week month with a final travel bag destination inspiration project and dare I say it? It is a Christmas card. I began by collecting together the items I wanted to use. Colours of paints and sand texture paste. 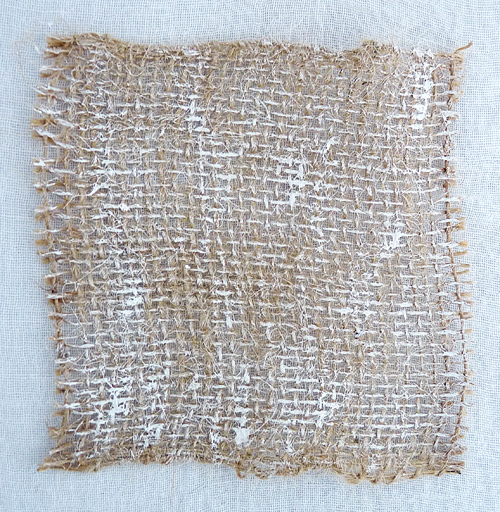 ... the hessian and mediums to use with it. 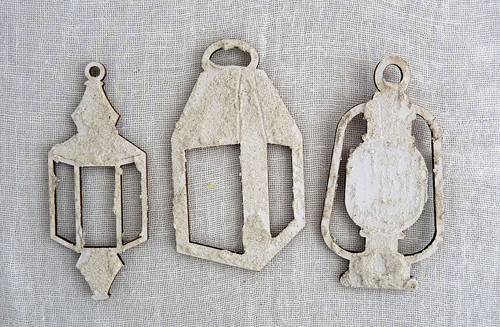 Cut the hessian to fit a card blank, seal the 'open' edges with fabric stiffener, this allows you to work with it without it fraying too much, then give it a light coat of the everlasting chalky paint. 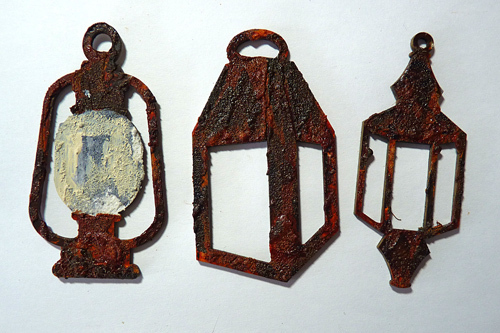 Create the rust effects on the lanterns. (Sorry these photos were taken with a daylight bulb and it's not the same as in natural light). 1. Apply the sand texture paste and heat dry. 2. Give random areas some watery wash of paynes grey. 3. Make some of the edges darker with carbon black. 4. 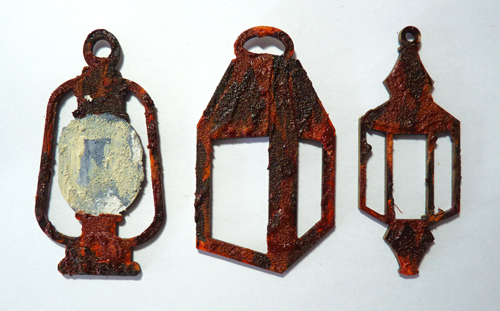 Paint some burnt sienna in other random areas. 5. 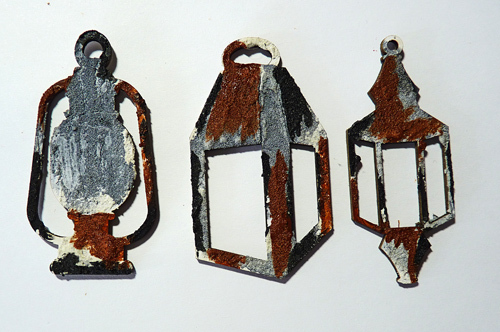 Repeat #4 with raw umber and paint a little titan buff onto the bowl of the left lantern. Up to this point you think you are never going to get a rusty effect. 6. 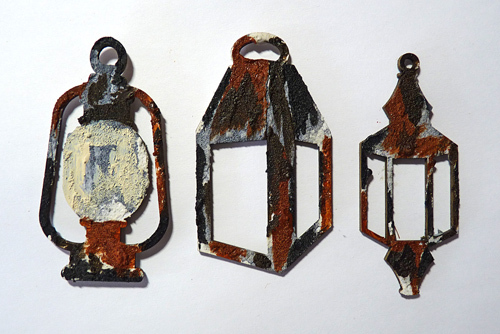 Now comes the rust in a bottle - paint over a layer of quinacridone gold. 7. Bring it all together with a wash of paynes grey. 8. Finish with a coat of ultra matte medium to give it a non shiny surface. 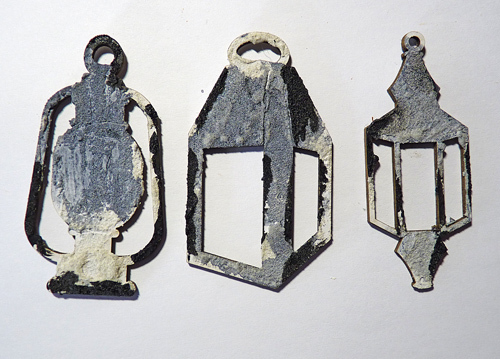 Now all of this is done I will make the lantern bowl shiny with a layer of liquid glass. It's always better to do too many and put the spares away for another day. They are bound to come in useful. I have already added in ultra matte medium and liquid glass to the products, you'll also see a few added items on the finished card. Now time to assemble everything. 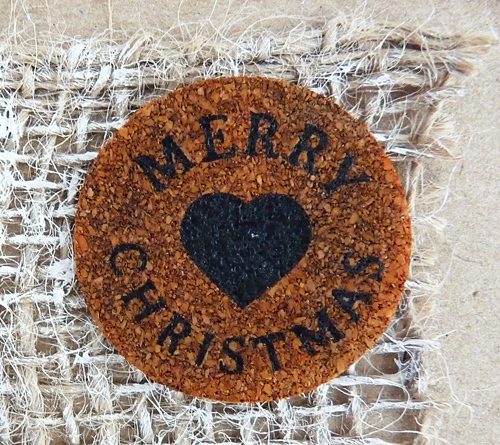 .... a cork sentiment which has been given a dirty wash of paynes grey and quinacridone gold mixed together. 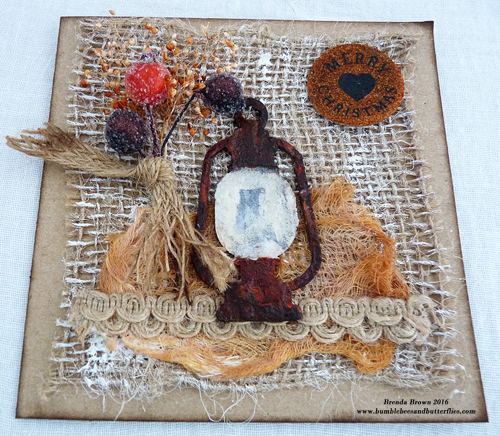 You can see I added some dried flowers sprayed with tea dye distress stain and I mopped up the surplus with some cheesecloth and glued it behind the lantern with some patterned jute ribbon to add interest. .... and there we are. 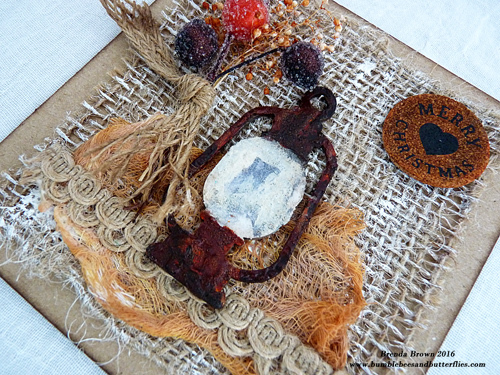 I think I've gathered all the travel bag contents together, sand texture paste, fabric and hessian, autumn colours, orange, brown and rust and with all my elements collaged together onto the card. The Cambridge dictionary defines collage as - (the art of making) a picture in which various materials or objects, for example paper, cloth, or photographs, are stuck onto a larger surface. So although this is not my normal style of collaging it still meets the criteria. Thanks to all the ladies who contributed one of the four contents to the travel bag which made up a brilliant challenge for us. We do enjoy making these DI projects so I hope you like looking and hopefully learning from them. We will see you on Friday when the lovely Anne will be the hostess - now I wonder what sort of theme she has chosen???? Those of you who know her well will probably be able to guess lol. And don't forget you have till this Thursday evening to get your projects in for the 'create within a frame' challenge. Fantastic texture makes this card so special! 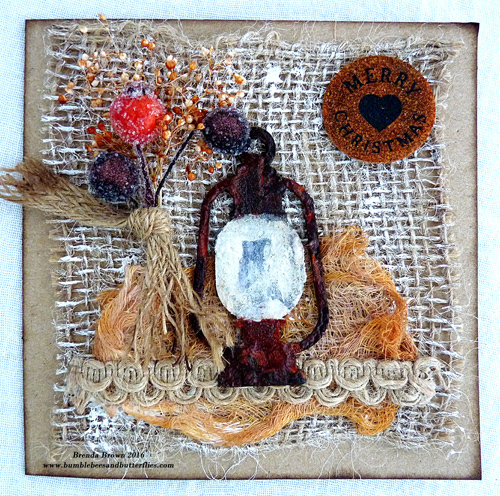 Fabulous rusty effects on this beautiful card Brenda, great effects and I love the finished result! A wonderful card Brenda with a real rustic feel. Lovely texture and rusty elements . Great use of the travel bag goodies . Fabulous, Brenda!! Thanks so much for this rust technique tutorial, very helpful. Congratulations to you on working in a different style than you usually do. I love to see artists stretching themselves. When I do, I find I always learn even though I may return to my usual style. I leave your blog to day inspired!! Thanks to you. Fabulous Brenda! Love the rust technique and gorgeous texture on this fabulous piece of work. 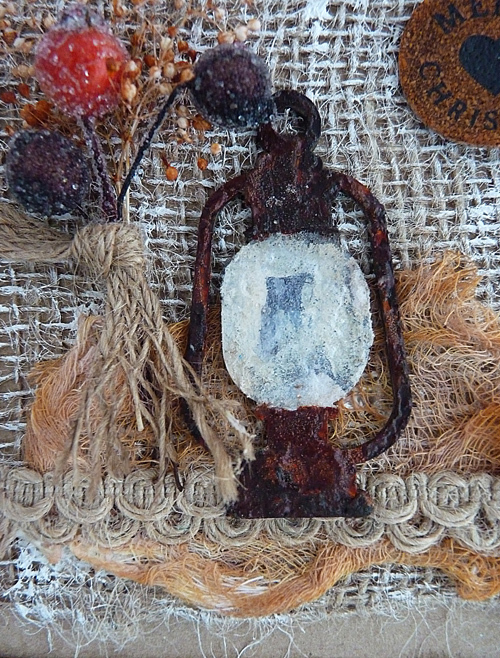 Love the texture and the rusty lantern! Very unique as a Christmas card! Now I've got to backtrack and visit all the others I've missed. 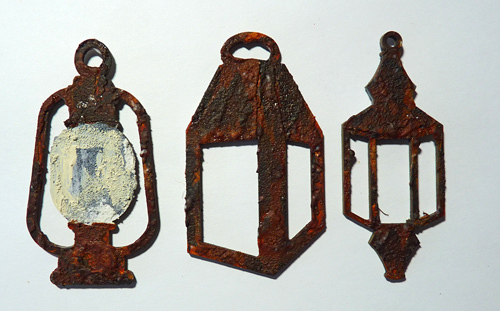 Wonderfully rusty and rustic! 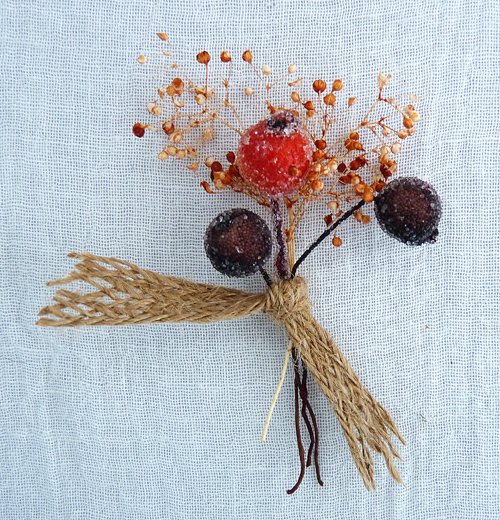 Fabulous tiny make - I just love it. Another amazing month of visits to Destination Inspiration.